One benefit of finding myself back in Hong Kong again a week after INTA is that it is less humid and generally drier, and I’ve been able to do some sight-seeing. I visited the Century Garden. I got tired reading the list of things that one cannot do there. No animals. No littering. No loitering. No children. I couldn’t see a sign banning patent attorneys but assume this is merely an oversight so I walked on by. I went on to the Hong Kong National History Museum. This shows the planetary conditions from the Devonian period on, and explains how this collection of mountainous islands was formed. It takes one through the geology and fossils down to Neanderthal man, and then through the early dynasties. There is a display of pottery, coinage, and tools from the stone-age through the bronze age, and it was interesting comparing the technology to that in the Middle East at the same time. There were displays of stuffed animals arranged in different ecosystems and touch screens that are disinfected hourly, that provided more details of the geology, fauna and flora. There is also a wing showing the cultures of the different ethnicities, including the Hokklo and Hakka with Taoist alters, dragon boats and wedding customs. It was excellently done and is highly recommended. Since falling on the stairs a couple of months ago, I’ve been suffering from vertigo. 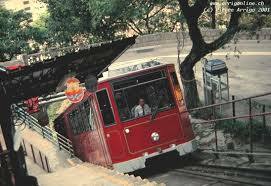 I think anyone taking the funicular railway to the Peak, which gives the illusion that the skyscrapers are tipping at an angle that would make Pisa look straight, must feel unsteady and confused. It is well worth it though. The view from the Peak is spectacular. One can walk around a botanical gardens with Victorian lamp-posts growing in Narnian splendour. Hong Kong is a paradox. With an English background, I tend not to notice that people drive on left and that there are a lot of English speakers. I am used to the electrical sockets and not surprised to find a Marks & Clerk Spencer. I understand that the mainland Chinese find Hong Kong very British. Aberdeen is a fishing village on stilts. It is a remnant from Hong Kong’s past. There are also markets. Just wandering around and seeing the sculptures and things is fascinating. I hope other INTA participants managed to do some sight-seeing. Tel Aviv prides itself that it is a city that never sleeps. It can’t hold a candle to Hong Kong, where every shop seems to be open 24 hours, and roads are crowded at all hours. ‹ Why? Is this night different?